Open MHGC. To do this, expand the Harmony Framework Configuration > Graphics Library > Harmony Graphics Library selection tree, and check the Use Graphics Library? box. 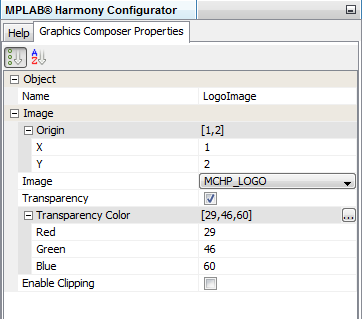 Click the Execute button beside "Create a Design With MPLAB Harmony Graphics Composer". Change the screen name from "Screen1" to "MchpMainScreen". 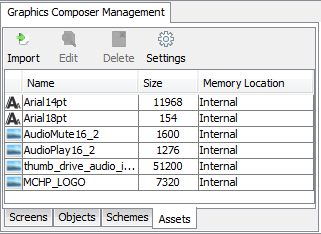 Find the "Graphics Composer Management" tab in the bottom left pane and double-click on the "Screen1" name to change it. You are not changing any of the properties of the screen, so keep the screen properties shown in the "Graphics Composer Properties" tab in the top right pane. Import the following images and fonts. These will be used for the display objects created in the "Add Primitive Objects" step below. 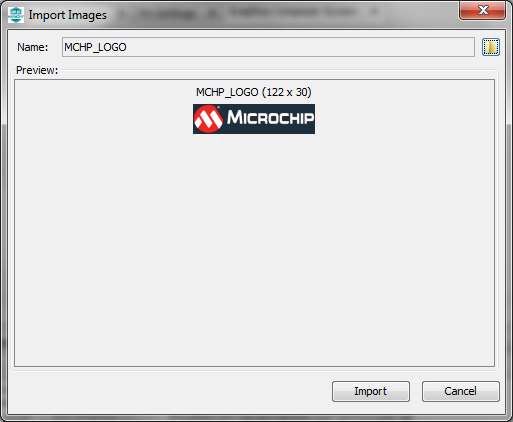 The Microchip logo will be applied to the LogoImage primitive object. 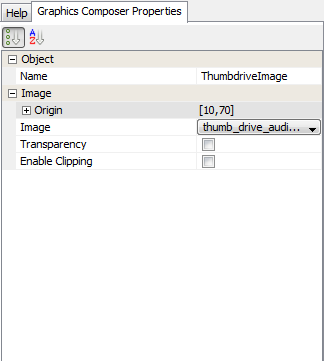 An image of the flash drive will be applied to the ThumbdriveImage primitive object. Two images will be applied to the VolButton widget. One for mute off (play) and one for mute on. Arial font, 14 point for ASCII numbers 32 to 127. This will be used for multiple schemes in the design. Arial font, 18 point for ASCII number 94. 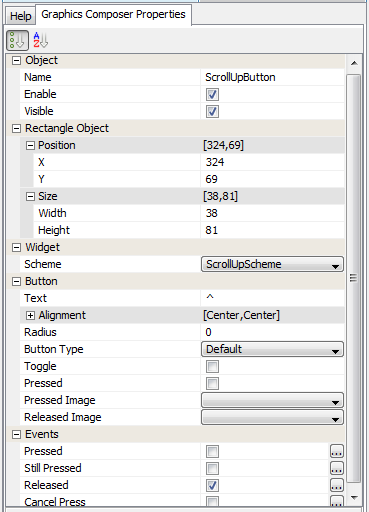 This will be used for the ScrollUpScheme, and applied to the ScrollUpButton widget. 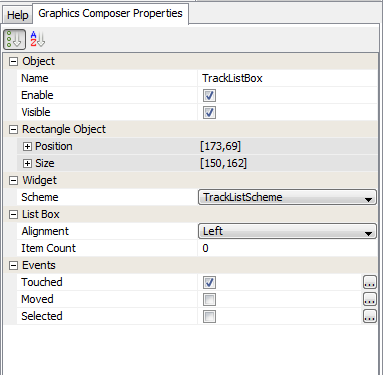 In the bottom left pane, in the Graphics Composer Management tab, click on the Assets sub tab. Import "System Font" Arial 14pt from 32 ASCII to 127 ASCII. 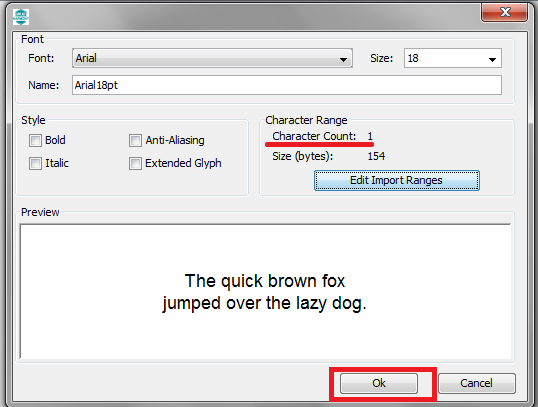 Click on Edit Import Ranges and select the required character range. This is an important feature that enables you to import only the characters you need, thereby limiting the amount of memory needed to store the font. Start Index indicates the starting ASCII value of the character. End Index indicates the last ASCII value of the character. Alternatively the range can be provided by Start Character and End Character. Import "System Font" Arial 18pt for 94 ascii. 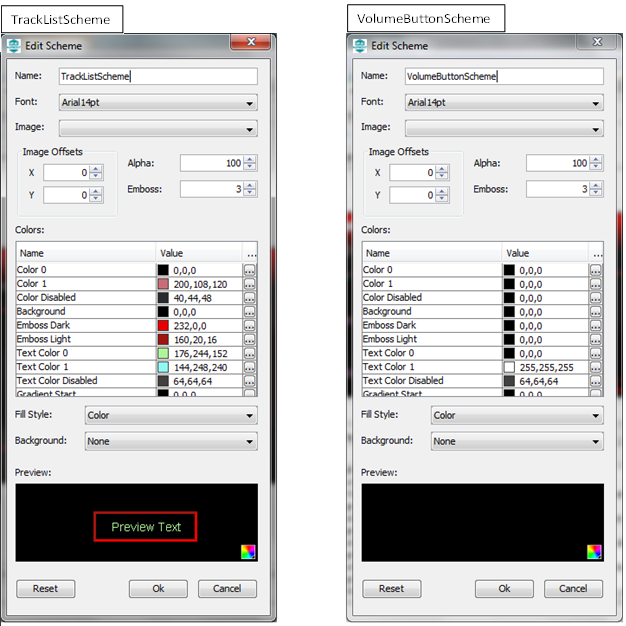 Create schemes to standardize the look and feel (fonts, colors, styles) of the user interface. These will be used for the display widgets created in the "Add Widget Objects" step below. Applied to TrackListBox, ScrollDownButton and VolSlider. 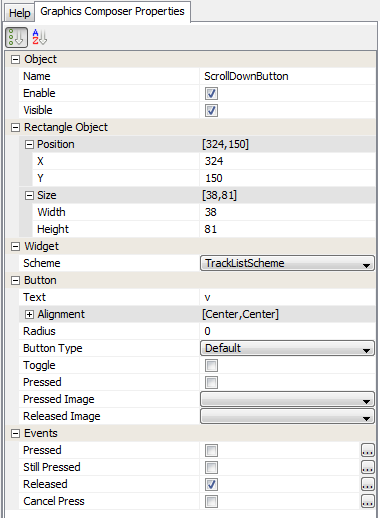 In the bottom left pane, in the Graphics Composer Management tab, click on the Schemes sub tab. A default scheme is present. 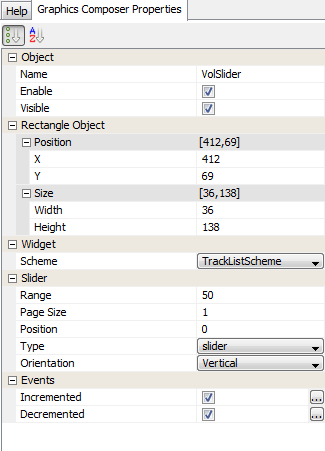 Create following custom schemes by clicking the Create button. 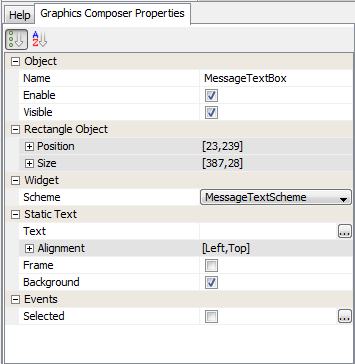 In the "Graphics Composer Tool Box" (top left pane), under the "Primitives" group, left-click and drag Rectangle onto the "Graphic Composer Screen". In the "Graphics Composer Properties" tab (top right pane), observe the properties of this Rectangle. Modify these properties as shown below. The screen will now look like this. 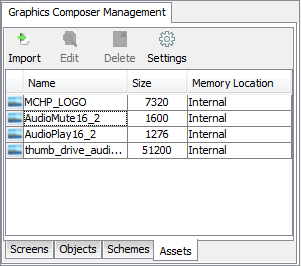 In the "Graphics Composer Tool Box" (top left pane), under the "Primitives" group, left-click and drag Image onto the "Graphic Composer Screen". 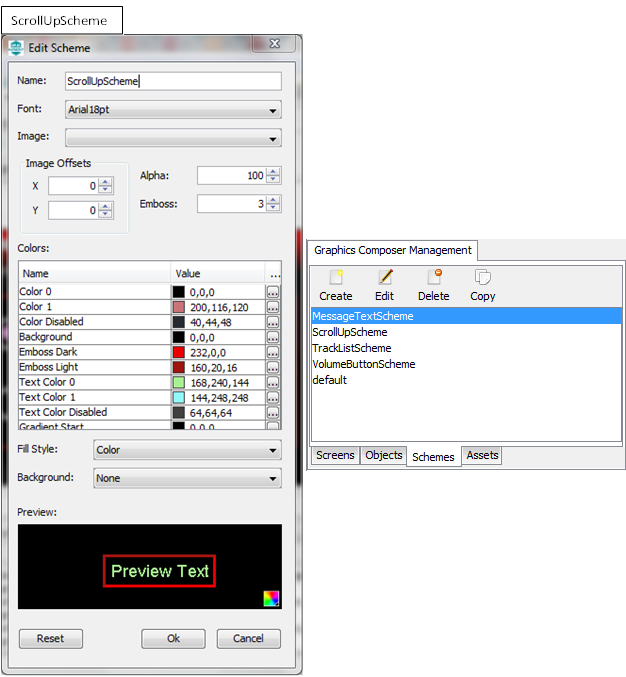 In the "Graphics Composer Tool Box", under the "Primitives" group, left-click and drag Text onto the "Graphic Composer Screen". ScrollUpButton: Button to scroll items up in the "TrackListBox"
ScrollDownButton: Button to scroll items down in the "TrackListBox"
MessageTextBox: Static text to display application messages. 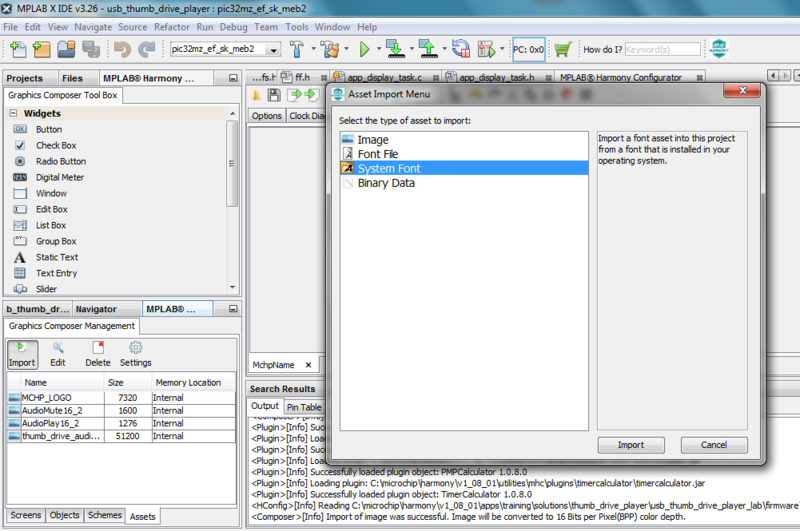 Left Click and drag List Box, Release the click on the screen under "Graphic Composer Screen". 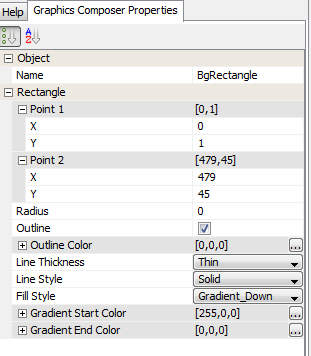 Modify the properties of the list box "Graphics Composer Properties" as below. Notice that the list box event Touched is checked. Click on the browse button to add/edit action to the list box event. It will open an Event Editor window. Click on the Add button to add an action to the Touched list box event. 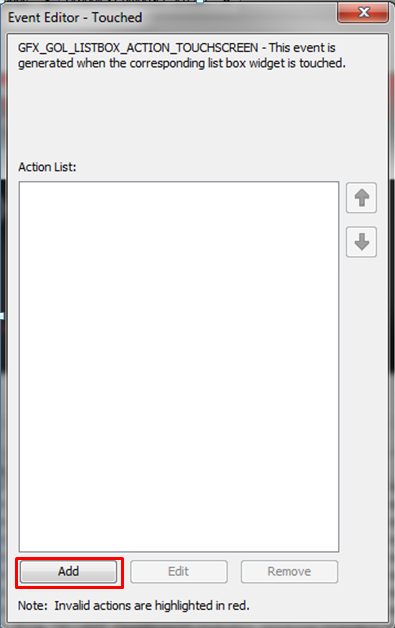 In the Action window, Select Type of action as Custom. Rename the action to CustomAction. Put the below custom code under Custom Action Definition. The custom code switches to the selected random track so that the selected random track is played. Left Click and drag Button, Release the click on the screen under "Graphic Composer Screen". 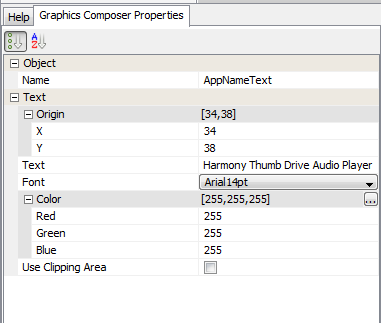 Modify the properties of the button "Graphics Composer Properties" as below. Notice that the button event Released is checked. Click on the browse button to add a custom action to the button event. In the Action window, select "Type" of action as Custom. 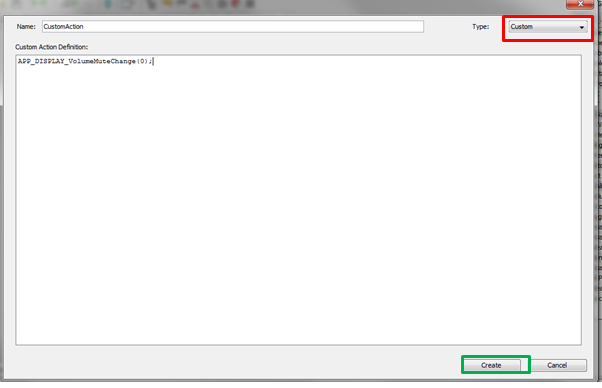 Rename the action to CustomAction, and copy the following code into the "Custom Action Definition" window. 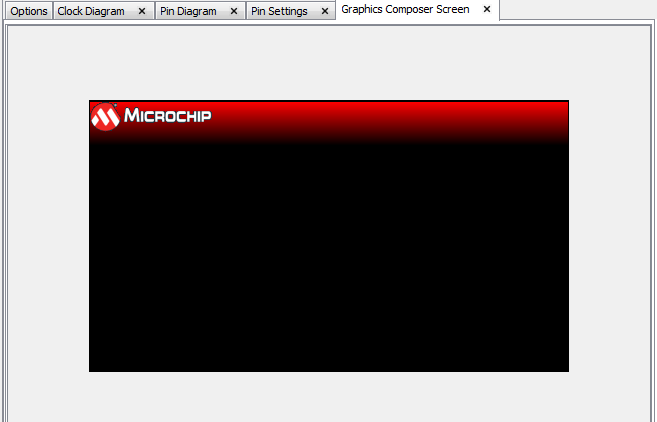 In the "Graphics Composer Tool Box", left-click and drag "Button" onto the "Graphic Composer Screen". In the Action window, select "Type" of action as Custom. Rename the action to CustomAction. 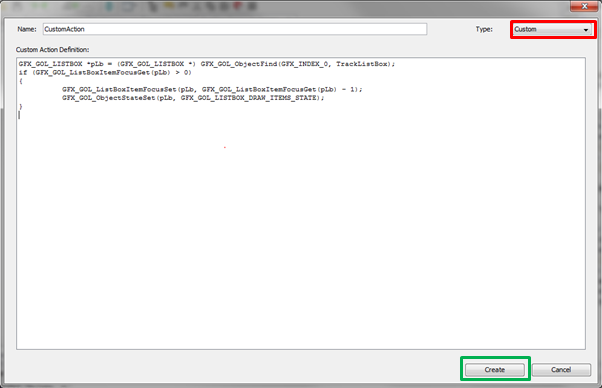 Copy the following code into the "Custom Action Definition" window. The custom sets the focus in the list box to one item below (next item) the current item in focus when the button release event is triggered. 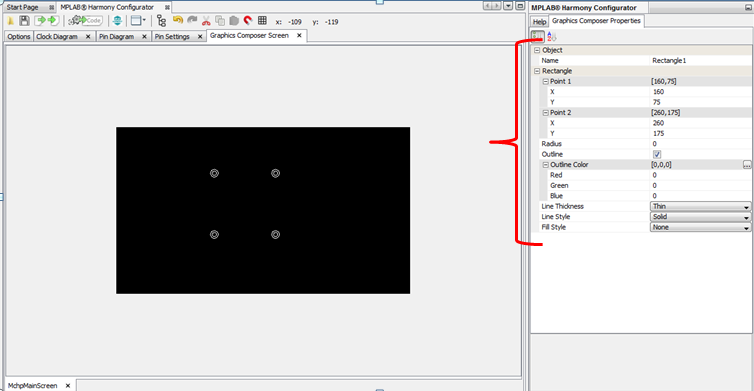 In the "Graphics Composer Tool Box", left-click and drag "Slider" onto the "Graphic Composer Screen". Notice that the slider events Incremented and Decremented are checked. Click on the browse button to add a custom action to the slider events. An Event Editor window will open. Click on the Add button to add an action to the slider Incremented event. In the Action window, Select Type of action as Custom. Rename the action to CustomAction. Copy the following code into the "Custom Action Definition" window for both events. 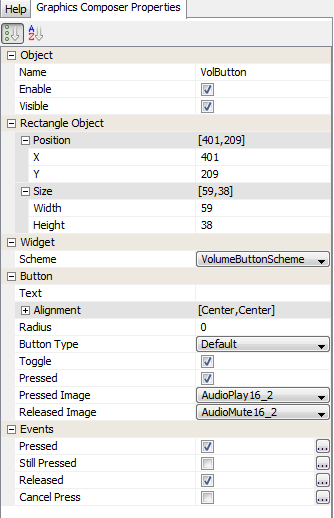 This code increments/decrements the audio volume based on the position of the volume slider. Notice that the button events "Pressed" and "Released" are checked. Also notice that the button has enabled the "Toggle" option. This option allows the button to be used as an ON/OFF button. Also notice the default state is "Pressed". The "Pressed" state corresponds to "Mute Off", and the "Released" state corresponds to "Mute On". Click the browse button to add a custom action to the button events. In the Action window, Select "Type" of action as Custom. Rename the action to CustomAction. 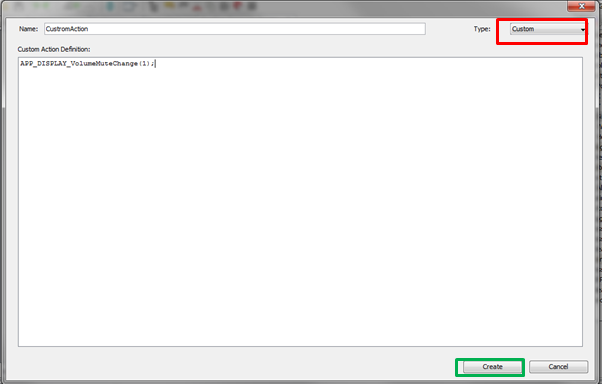 Copy the following code into the "Custom Action Definition" window for the Pressed event. and copy the following code for the "Released" event. 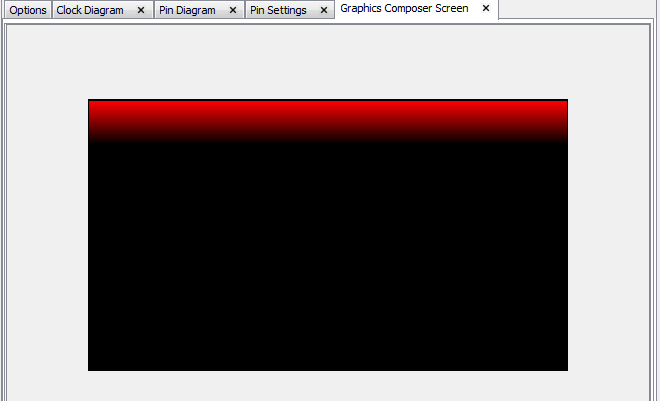 In the "Graphics Composer Tool Box", left-click and drag "Static Text" onto the "Graphic Composer Screen". Since the "Visible" property of the Static Text is unchecked, the static text will not be visible on the screen. Check the "Visible" property to verify the text, and then un-check it again. Click on MHC's "Options" tab to verify the Graphics Library has been properly configured as shown in the following image. Enable the touch control feature of the graphics display on the MEB II board. 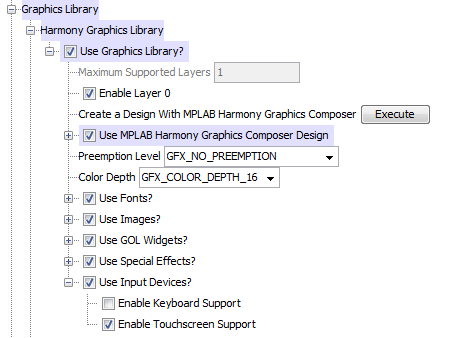 In MHC's "Options" tab, expand the Harmony Framework Configuration > Drivers > Graphics Displays > Use Graphics Display? selection tree. Notice the display has been correctly selected for you (MEB II uses a 4.3 inch, WQVGA display by NewHaven). 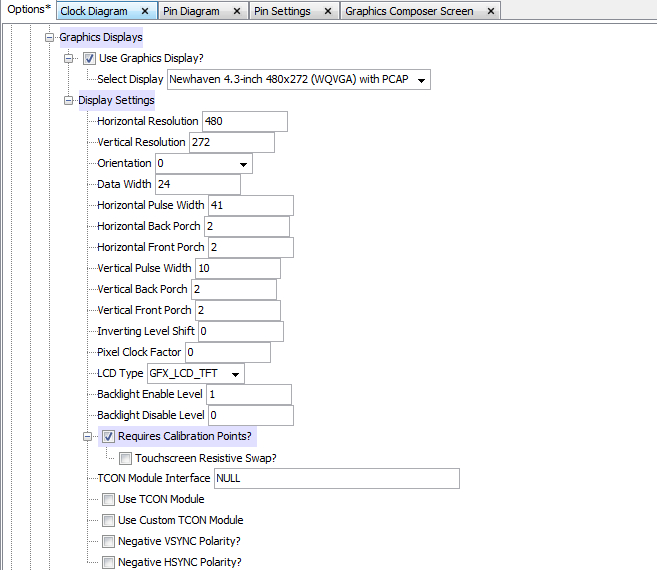 Expand Graphics Displays > Display Settings. You will keep all settings as is. The Display Settings have values specific to the display (4.3 inch, WQVGA display by NewHaven). These include horizontal and vertical timing parameters and others. For details refer to the display data sheet. 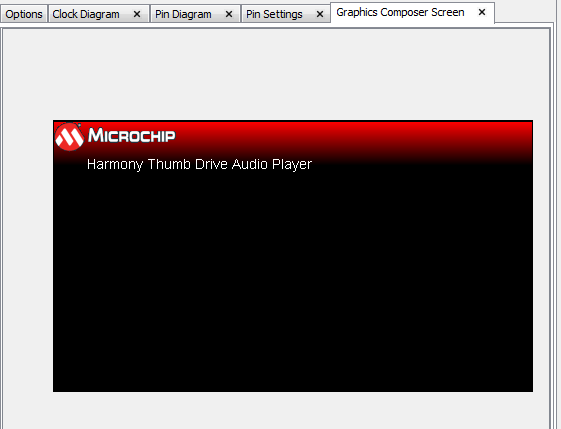 Configure the display Touch driver (MTCH6301) to use I2C Driver Instance 1. Note I2C driver instance 1 hasn't been created yet. You will do this a couple of steps from now. 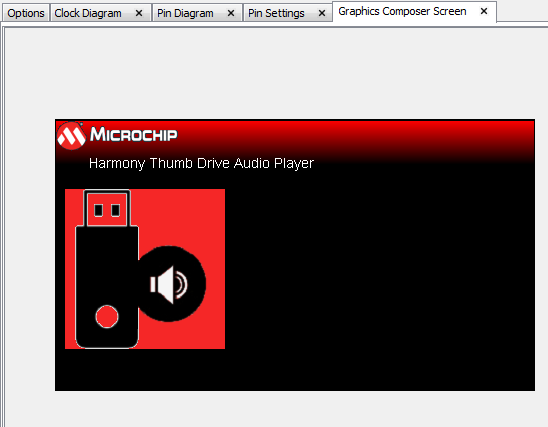 Expand the Harmony Framework Configuration > Drivers > Touch > MTCH6301 > Use the MTCH6301 Driver? selection tree. Keep all options the same, except for the "I2C driver module index". 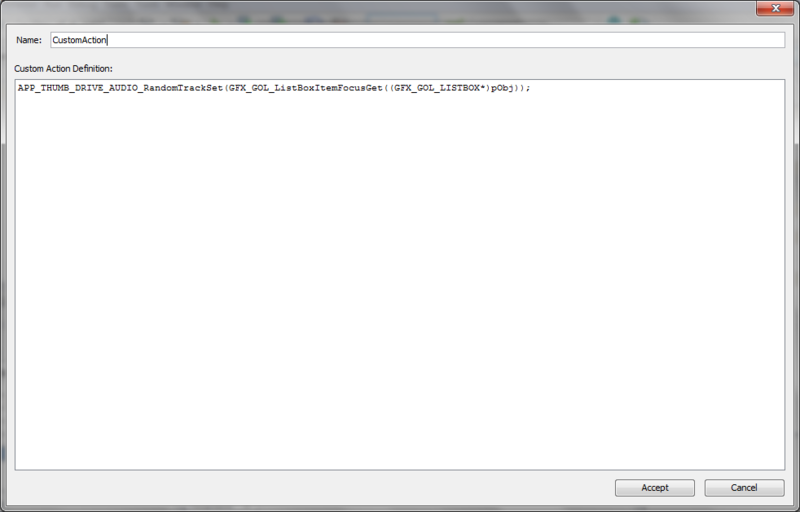 Change this to use "DRV_I2C_INDEX_1" (I2C Driver Instance 1). 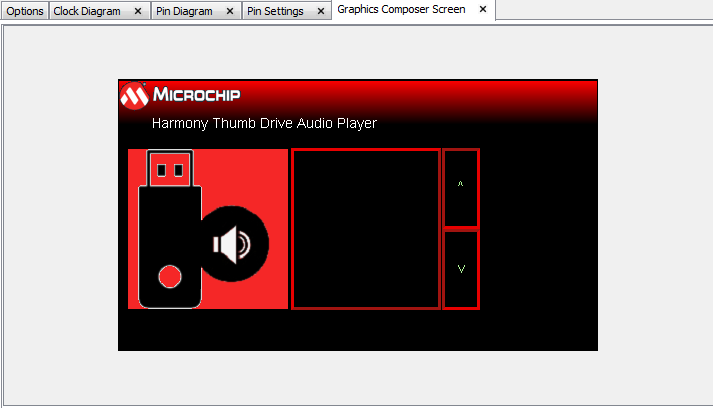 Verify/Set the I/O pins used by Touch driver using the Graphical Pin Manager. 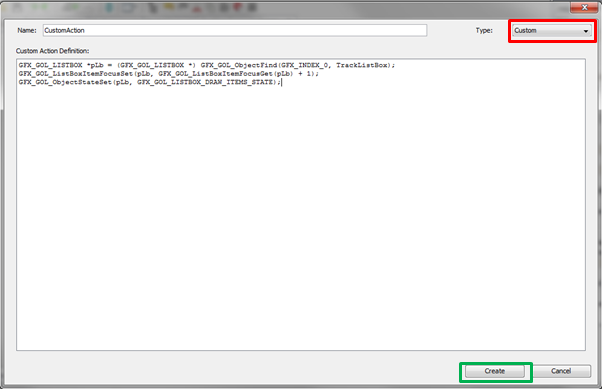 The touch driver uses PIC32 external interrupts source 1 for touch events. Select MHC's "Pin Diagram" tab, and in the lower pane, select MHC's "Pin Table" tab. Map the "External Interrupt 1" signal to pin "RE8" as shown in this image. (For schematic, refer to the MEB II User’s Guide). 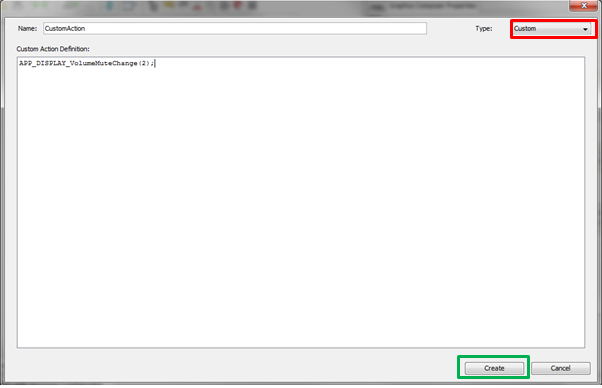 Add a new client and driver instance for the existing I2C driver. In Step 2 of this tutorial, you created a Dynamic I2C driver, and created a client for this driver. You also configured an I2C driver instance (I2C Driver Instance 0) for this client. This client and instance is used by the AK4953 audio CODEC. In this step, you will add another client and instance (I2C Driver Instance 1) for this driver for the display Touch driver (MTCH6301). 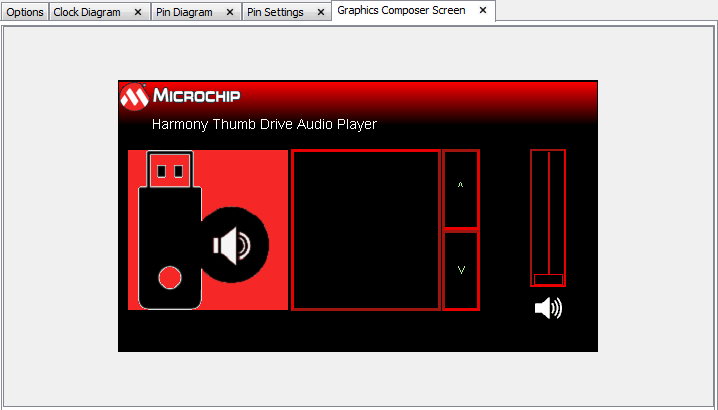 Expand the Harmony Framework Configuration > Drivers > I2C > Use I2C Driver? selection tree. 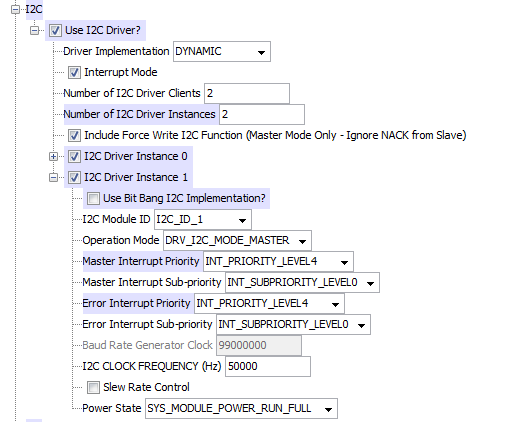 Modify "Number of I2C Driver Clients" and "Number of I2C Driver Instances" to 2. 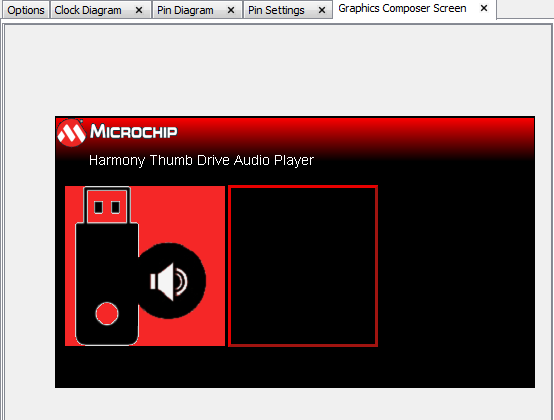 You configured "I2C Driver Instance 0" in audio_player_lab1. Just verify "Use Bit Bang I2C Implementation" is still unchecked. Expand "I2C Driver Instance 1", and make sure "Use Bit Bang I2C Implementation?" is unchecked. Since you are using the PIC32 I2C peripherals, you do not want to use the bit banged driver implementation. Retain "I2C_ID_1" as the "I2C Module ID". "I2C_ID_1" refers to the PIC32 I2C1 peripheral (using pins SCL1 & SDA1). These pins are connected to the display touch controller on the MEB II board. Retain default value "DRV_I2C_MODE_MASTER" as "Operation Mode". The PIC32 I2C module 1 will be the master, and the Touch MTCH6301 interface will be the slave. Change value for "Master Interrupt Priority" and "Master Interrupt Sub-priority" as INT_PRIORITY_LEVEL4 and INT_SUBPRIORITY_LEVEL0 respectively. Lower priority for touch events is OK as this will not be occurring very frequently. Change value for "Error Interrupt Priority" and "Error Interrupt Sub-priority" as INT_PRIORITY_LEVEL4 and INT_SUBPRIORITY_LEVEL0 respectively. The "Baud Rate generator clock" is configured for 100 MHz. This is derived from the Peripheral bus 2 clock frequency generated from the 198 MHz system clock. Retain the default value of 50 KHz for "I2C CLOCK FREQUENCY". Retain the "Slew Rate Control" as unchecked. This function enables the I2C module to use high frequency signalling, allowing it to use the 400 kHz and 1 MHz signalling rates. Retain the default value of "SYS_MODULE_POWER_RUN_FULL" for "Power State". You will want to run the I2C module in normal power mode. Verify the I/O Pins used by I2C module. Click on MHC's "Pin Diagram" tab, and in MHC's lower pane, click on the “Pin table” tab. The I2C1 has dedicated pins for SCL1 and SDA1 signals. These pins are hardcoded and configured by the I2C driver. The Harmony touch display driver is used by the Harmony Touch System service. 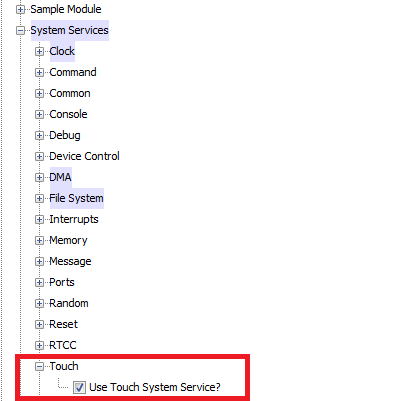 Expand the Harmony Framework Configuration > System Services > Touch selection tree, and check the "Use Touch System Service" box.